Eluned,known as Lyn to all her friends was born and brought up at Plas Brereton Farm, Caernarfon where the fields run down to the sea. Lyn first taught in Rochdale, Lancashire and later moved to Newport, Gwent where she taught at Belle Vue and Stow Hill Secondary Schools. Subsequently, she joined the art department at Hartridge High School, Newport, with an intake of 2,000 children. There Lyn established a very successful Textile Art Department, embracing creative weaving and machine embroidery within the art department. This school was really challenging and she enjoyed her time there. In the seventies Lyn returned to North Wales where she became a senior lecturer in Art Education at Bangor Normal College and taught both undergraduate and postgraduate students. She spent fifteen happy years there but she felt the need for a change of direction. Travel was something which up until now was on hold and so in the late eighties Lyn took early retirement and travelled widely with her husband Ian. She also used this time to develop her own textile work and was able to undertake several private commissions including work for Harvey Nicholls London. As her work progressed she began to introduce print and paint into her work and the interest in fine art began. Memories of childhood spent on the seashore in all weathers observing and gathering flotsam and jetsam, her love of philosophy, music and literature often inspirs her art. This was reflected in her exhibition "Pedwaredd Gainc Y Mabinogi" which opened at The Tabernacle M.O.M.A Wales Machynlleth and toured museums, galleries and libraries throughout North Wales. Another exhibition followed entitled "Journey"; this was inspired by the flooding in 1967 of Capel Celyn, near Bala in order to create a reservoir which would supply Liverpool with water. enabled her to explore images of loss, renewal, transformation and celebration of man's faith, mind and imagination when faced with adversity and obliteration. Lyn said: "Colour has always underpinned and been celebrated in my work. It is one of those elements that is expressive in its own right, creating mood and meaning. As you see from my work, representing the landscape is not my starting point, but it is through the process of drawing from nature that new forms are born. It is from these drawings and further studies in the studio that metaphors for the human condition emerge and in turn become my landscape and focus." Lyn's travels through Asia and America to Polynesia where she experienced the diversity of colour and different cultural experience have greatly influenced her art. 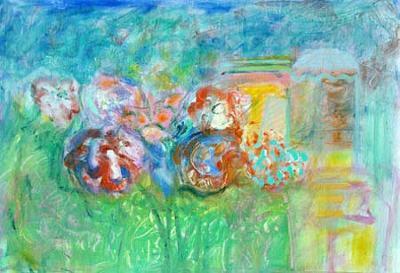 Nearer home several artists have inspired her, in particular Monet, Bonnard and Chagall. Her visit to the Marmotan Museum in Paris and Monet's House in Givernay left her spellbound. Today, she very much enjoys and admires the work Shani Rhys James and Mari Lloyd Jones. Of this exhibition Lyn said, "I chose this title because I wanted this exhibition to be a time to explore new ideas without restraints and to give myself the freedom to enjoy and develop new images. As a result the freedom to use marks and colour to create form, composition, and the creation of illusive space became my inspiration for this collection of paintings. The process has been for me a dance of action, interaction, expression and restraint, which continued until the paintings were complete." Eluned Tudor grant's work can be seen at Tegfryn Gallery, Plas Glyn Y Weddw and at her studion in Beaumaris.